HomeNearly 21,000 Vietnamese Students in the U.S.! Nearly 21,000 Vietnamese Students in the U.S.! SEVIS (Student and Exchange Visitor Information System) came online in 2003 to track and monitor the status and activities of nonimmigrant students and exchange visitors who enter the U.S. This web-based system collects real-time information on these two groups, plus approved schools and program sponsors. SEVIS by the Numbers (PDF download ) is a statistical summary report produced using data compiled from SEVIS. The quarterly review below is based on information retrieved on 1 April 2014. The last update was on 15 January 2014. Many of us who follow these trends actually prefer these quarterly updates to the annual Open Doors reports on international academic mobility, which use data that are already a year old. The difference is that the SEVIS reports include all levels and types of education and training (e.g., 5,888 and 53,292 international students are currently enrolled in U.S. primary and secondary schools, respectively), while Open Doors only includes information about regionally accredited institutions of higher education. Since January 2014, the total number of SEVIS records for active nonimmigrant students, exchange visitors and their dependents has increased by 2.68%, from 1,315,528 to 1,350,746. 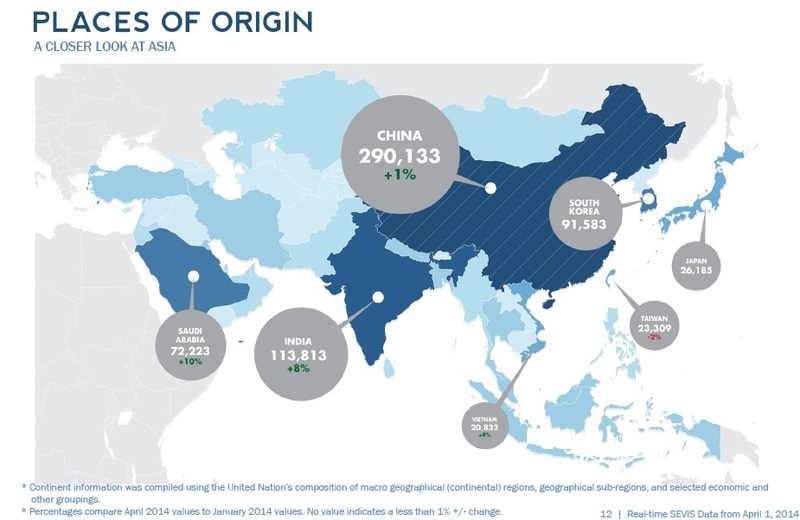 Not surprisingly, 29% of all nonimmigrant students are from China, followed by 11% from India. In fact, 85% of all F & M students in the U.S. hail from Asia. Rounding out the top ten are India (South Korea, Saudi Arabia, Canada, Japan, Taiwan, Vietnam (#8), Mexico and Brazil. The number of Vietnamese students in the U.S. jumped from 20,035 in January 2014 to 20,832 in April 2014, a 4%, increase. Vietnam continues to lead the third tier of “top ten” countries with more students than Mexico or Brazil. 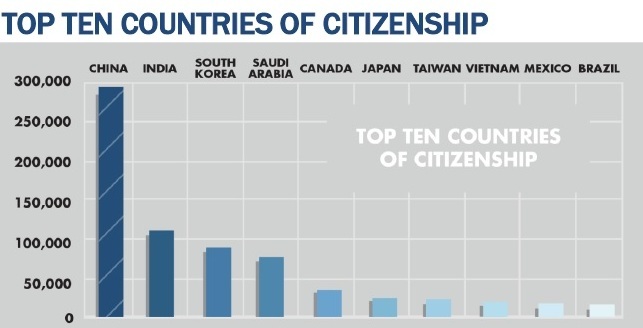 My guess remains unchanged, i.e., that Vietnam will surpass Taiwan and Japan in the next five (5) years. Business, Management, Marketing are still the most popular majors with an enrollment of just over 200,000. 72% of active students are enrolled in bachelor’s, master’s or doctoral programs. 56% of all international students are male. Of SEVIS-approved schools with active students, the visa distribution is as follows: 84%/F, 10% F/M and 6%/M. The top five F-1 approved schools are the University of Southern California (USC: 10,635), Purdue University (9,625), University of Illinois (9,436), New York University (NYU: 9,220) and Columbia University (9,110). 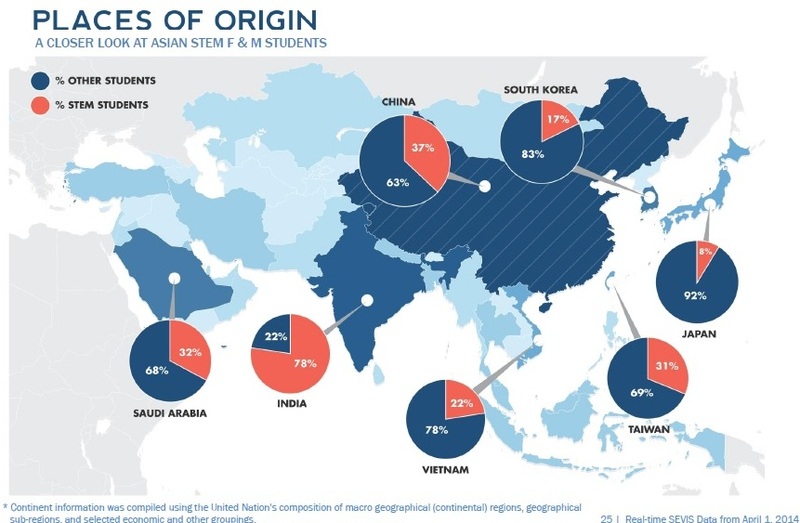 Finally, here is a new graphic that looks at places of origin in Asia for STEM F & M students. As you can see, 22% of all Vietnamese students are in STEM (science, technology, engineering and mathematics) fields.